It’s fun to see data about yourself. So upon learning that you can download all of your facebook data, I think it’s natural to want to analyze it. Facebook makes it quite easy to download all of your data, but analyzing it is harder. You get a .zip file with a lot rather ugly html pages in it filled with everything you’ve done on facebook. It’s not conducive to seeing patterns or understanding your usage. 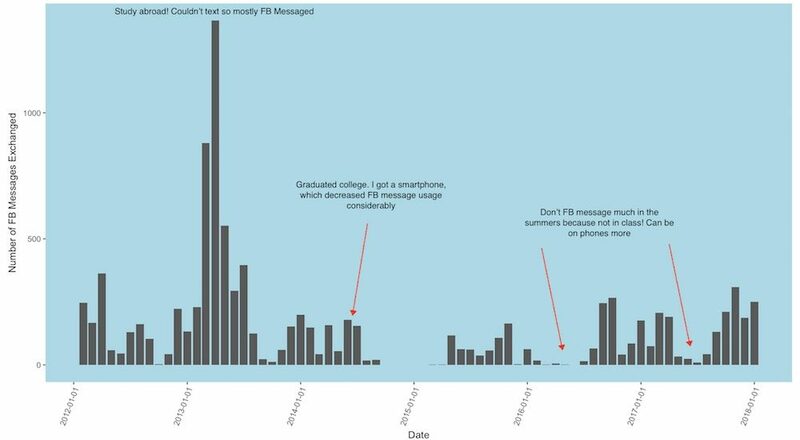 I decided to look at my facebook message history in R. Mostly I was interested in how my message frequency changed over time with specific people. It’s cool to see a graphical display of a relationship as it matures (and, sometimes, abruptly ends). I’ll walk through how I went about the analysis, from downloading the data to creating the graphics. This is really easy. Navigate to facebook.com/settings and click on the link at the bottom. That’s it. A zip archive with all of your activity will download. Explore this a bit to familiarize yourself with the data and to revisit wall posts from 8 years ago. Now, I read the url of the “messages” section into R. A great resource for getting started with web / html scraping is from Hadley Wickham here. Here’s the code I used for the analysis.. Please let me know (@jhovde2121 on twitter) if you have any questions or any suggestions on how this could be done in a better way. Get the data: First, get the filepath of your message file. Then, choose which friend you want to analyze data with. I just used CTRL + F to find the friend and then used that file path (it so happens that this friend was number 691). If you wanted to analyze all of your messages to everyone, you could loop through all of your friends and use that data instead. # reformatting the dates. This takes some patience. Now that I have the dates properly formatted, I do some analysis to check out the change of messages over time. I use the cut() function which can breka your dates into weeks, months etc; it was new to me and is very useful. # This is a chart of number of messages per day. Can see patterns but it's too granular. # This cuts the data up by week. Very useful! Thanks for reading! If you enjoy this type of analysis, follow me on twitter or sign up to be notified of new posts below.